Daily — Tue, Fri: 12:05 p.m.; Mon, Wed: 6:30 p.m.
St. Joseph, much like its patron saint, has never received much publicity in over 140 years of serving the community. But for long-time parishioners, the church and its towering steeples—the city’s tallest twin spires—have been the center of a section still referred to as “The Point” and “Butchertown.” Established in 1866, St. Joseph served German-speaking families who worked in the numerous slaughterhouses and butcher shops situated around the stockyards. German immigrant Catholics had previously traveled to St. Martin or to St. Boniface, both distant enough to be inconvenient. Father Leopold Walterspiel was the first pastor; one of his first tasks was to organize the St. Elizabeth Ladies Society—still active today—to assist in raising funds for the first parish structure. This red brick school and church combination was completed and dedicated in 1866. The Ursuline Sisters of Louisville staffed the school, which opened in the fall of 1866 with 236 students in grades one through eight. It educated St. Joseph’s children until 2003. Parishioners also formed a number of clubs. The congregation quickly outgrew the church. Father William Van der Hagen, the second pastor, spearheaded the construction of an addition to the church and a living space. To support the building program, parishioners held a fair, the forerunner of today’s parish street social. The renovations and additions were completed and blessed in 1871. Franciscan Friars served St. Joseph from 1875 to 2002. 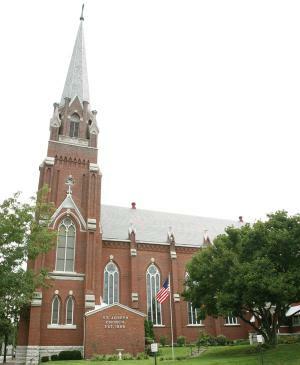 The second Franciscan pastor, Father Aloysius Kurtz, O.F.M., is considered the “second founder;”he assisted the parish in wiping out its debt and in building its Gothic-style church, consecrated in 1866. Father Aloysius laid bricks alongside the workmen. This fast-growing parish, approaching 1,100 parishioners, continues to serve immigrants, now welcoming migrant Latino-Hispanics. A weekly Mass celebrated in Spanish has replaced earlier German-language liturgies. Still the center of Butchertown, the thriving parish responds to the community’s changing needs.